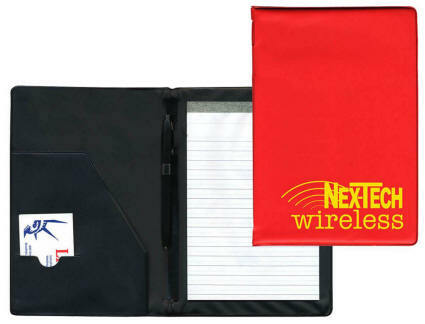 Flexible Cover Letter Size Desk Folder Made in U. S. A. 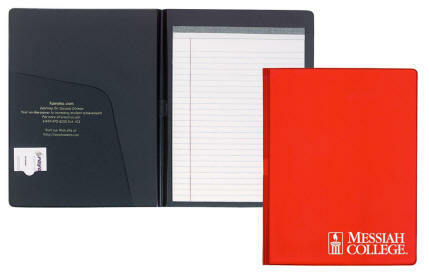 Includes 8 1/2" X 11" ruled pad. Large pocket on inside left cover includes a business card slit, pen loop. Eighteen colors of vinyl are available. Price includes five lines of straight line copy up to 4" X 5". Add a $65.00 die charge for logos. Made in the U. S. A. Similar design to above folder. Includes 5" X 8" ruled pad. Price includes five lines of straight line copy up to 4" X 5". Add a $65.00 die charge for logos. Pocket for extra papers, business card slit, pen loop. Made in the U. S. A.